New Yorkers depend on our subways, buses, ferries, and bridges every day. They are the lifeblood of our City. Yet our transit system is run by the MTA, and controlled by Albany. We pay the price. Join Mike Bloomberg. Demand Better Transit Now! 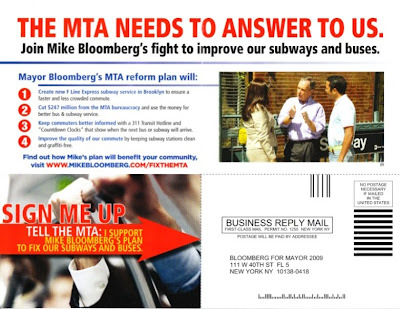 In other words, Bloomberg doesn't like the governance of the MTA. Bloomberg appointees have four votes on the MTA board. Governor David Paterson's six appointees have six votes. Representatives from seven suburban counties have a total of four votes. There are six other nonvoting members. Two of Bloomberg's appointees led the argument in June that the MTA should revise the Vanderbilt Yard deal at the request of Forest City Ratner. Paterson's appointees, in the main, followed Bloomberg's wishes. Sure, while the MTA system is regional, New Yorkers have an argument that there should be more city control of the New York City Transit System. Bloomberg doesn't make that argument; he just argues for his plan (free crosstown bus service, countdown clocks on subway platforms, etc.) --a plan, as noted on Streetsblog, with no funding mechanism or any effort to reform governance. Meanwhile, Bloomberg's leading the charge against public authorities reform, changes which would require MTA board members to follow their fiduciary duty, to act in the best interests of the agency, not the officials who appointed them. He doesn't want such improvements. He just wants control. This is the man the New Yorker called a good mayor.